The Dallas-Fort Worth Bogleheads® is the first local chapter listed on the Bogleheads list of chapters. The chapter was founded on January 24, 2005, two years before the founding of the independent Bogleheads forum, and is thus designated the DFW Diehards Local Chapter on the chapter’s Yahoo Groups site. The group has met regularly since its beginning. Meetings are normally scheduled for the second Saturday of every month. The usual meeting venue is the open seating area of Jason’s Deli on MacArthur Blvd. in Irving, Texas. The group has no officers. Meetings are informal gatherings; some meetings have pre-planned agendas but most do not. Topics for discussion at meetings are not limited strictly to Vanguard or financial/investment/retirement matters. The group does not provide personal financial advisement or forecasts, but we welcome and engage open discussion surrounding financial/investment/retirement issues, situations, or questions that members, or guests of members, may bring to the meetings. Many of our members have been attending our local meetings for many years, and, as such, our meetings can be as much social as they are informative. Membership and meetings are open to all. One of the highlights in DFW local chapter history was the chapter’s hosting of the 2009 Bogleheads national conference in Fort Worth Texas. To handle this special occasion, the chapter formed a committee to organize the event. 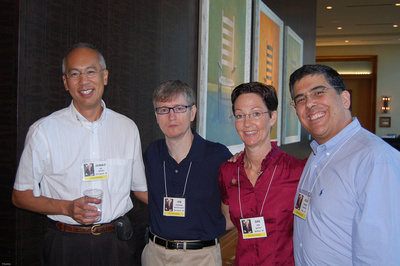 The conference was successfully held from September 30 – October 2, 2009. The committee members behind the scenes who made Bogleheads® 8 happen are pictured in this group portrait.